First week of July already! It's going to be a fun week. We're planning a little camping trip. I hope the weather will be good, since we're going to be in a tent. I'm not going to be doing my typical OAMC this month. Instead, I'm going to be doing batch cooking. Which means when I make something, I'll make extra of that recipe and freeze it for later on in the month. Since all my children will be here this month, I'm going to make an effort to keep them busy. I love how Jessica at Life as Mom came up with her very own Summer Camp for her children. She outlined activities, books, field trips, movies and even meal ideas for some summer fun. Since we are planning our camping trip, I'm going to tailor our week after her Great Outdoors week. So that's our week and it's jammed packed. We like it that way! 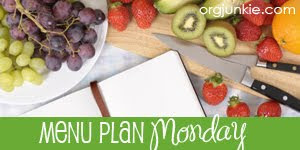 Be sure to visit I'm An Organizing Junkie for more meal planning ideas and great recipe links. You are having a busy week! Can't wait to hear how those new recipes turn out. Have fun camping, we may be camping to, we have to see how everyones schedule is. Your menu sounds really good. I am excited to see how some of those recipes turn out!